After years of campaigning (see The Bugle, Feb 2009 with Martin Linton’s long stand), projects and postponing, the London Mayor and the Government eventually agreed on the funding for the go ahead of the phase 2 of the East London Line extension, running from Clapham Junction to Docklands (click on map on the left to see it bigger). Work on phase 1 (link between Highbury and Croydon) is due to open next year. Work on phase 2 will begin in 3 months and is due to finish in May 2012 (i.e. before the 2012 Olympics). This is a great news for all residents of South London. However, not wanting to sound too negative in the over-joyed atmosphere, I cannot prevent myself to wonder about the cost of this project (£75 millions, with £30 millions split between TfL and the GLA), compared to the £1.2 billion spent for phase 1 (and compared to the £3.5 billion project of the Jubilee Line extension). 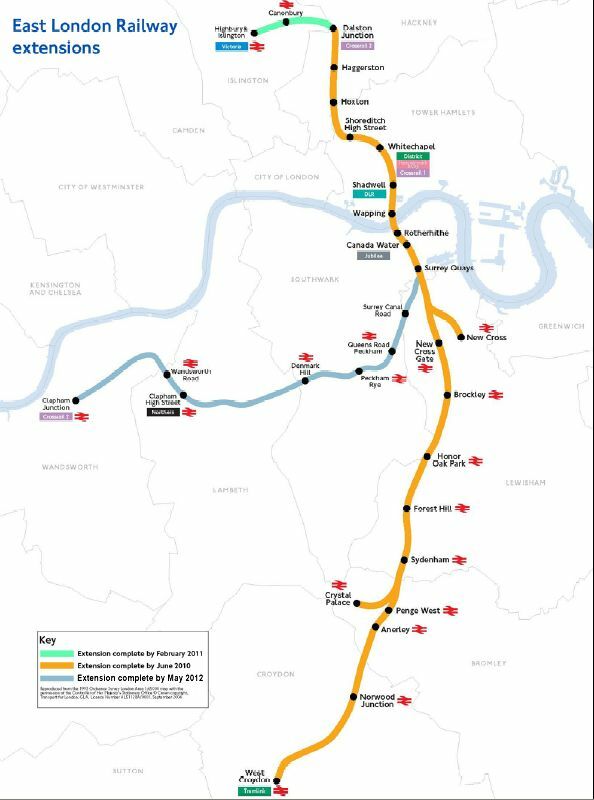 In phase 2 of the extension project, only a 2.5 km (1.5 mi) link is planned from south of Surrey Quays to the Network Rail South London Line to Clapham Junction. The rest of the route will be on a disused alignment which until 1911 was used by trains from Rotherhithe to Peckham via the now defunct Old Kent Road station. In the current scheme, trains are meant to pass very close to Brixton Tube station, but not stopping as they will use the old rails and no investment is planned to link with the Victoria line! Currently, Metro Shopping Fund is proposing a destruction of hundreds of jobs in the area and Network Rail is suggesting that “with the limited funds that are available to the railway industry there is no guarantee that Clapham Junction will be anymore successful [to get funding in the future]. We therefore need the Metro scheme to deliver the major improvements to the station ” (in letter addressed to the Council). Shall we think that Wandsworth and Britain’s busiest station are not a priority for London authorities and therefore are not worth any proper investment? And by the way, do you think that we need, as a top priority, 500 more flats in high tower blocks just beside the station, or take advantage of the privileged location to welcome businesses? This entry was posted in Clapham Junction, Twin towers in Clapham Junction by Cyril Richert. Bookmark the permalink. Phase 1 is up to Dalston Junction and down to West Croydon, with a spur to Crystal Palace, opening in mid-2010. Phase 2a will link Dalston Junction with Highbury & Islington, opening in 2011. There is a huge difference in cost between Phase 1 and Phase 2b because Phase 1 involves a great deal more work, including rebuilding Dalston Junction station, building four new stations with step-free access (Dalston Junction, Haggerston, Hoxton and Shoreditch High Street) and linking them all up, removing the old line to Shoreditch, major changes in the New Cross and New Cross Gate area to build the new alignment for the extension, and significant improvements to almost 20 stations on this extension. I agree that Clapham Junction station should be given a considerable amount of investment by the Government (ie via Network Rail) as it is clearly not fit for purpose as a 21st century major transport hub. 10 years of lobbying for the use of a a disused track and not even one penny for linking with the Victoria line in Brixton, Network Rail trying to avoid to pay any refurbishment in CJ… that’s shameful! PS: read this on the BBC? I am involved with helping to deliver Metro’s proposals for Clapham Junction. It is a big part of my job to correct misunderstandings about the proposals and the state of funding for Clapham Junction. Network Rail is supporting the planning application but not to save money. In 2008, Network Rail applied for £56m of funding from the Office of Rail Regulation. This request was turned down, with only £20m being allocated specifically for lengthening of Platforms 14-17 to accommodate 10-car trains. The platforms can only be lengthened to current standards using the land released by the Metro proposals. Without the Metro proposals, this platform work cannot go ahead and the £20m will then have to go to improving other parts of the extensive route network and not to Clapham Junction. Network Rail cannot apply for any more funding until 2014, with no guarantee of success. This is not blackmail, as some opponents have suggested: it is simply a fact. Brendan> Thanks for your comment. Can you explain a bit more, and link with documents that can be verified? Why is it ONLY by building two 42 storey skyscrapers that it is possible to extend the platforms? Is building a skyscraper the only way of releasing land in London? If so, can you point out the specific documents telling this? Regarding Metro’s proposal, why is it absolutely necessary for lengthening the platforms, but on the other hand Metro does not even bother sorting out the land they need with PCS? I am really looking forward to your responses. But indeed, if you are telling Londoners that now that Boris Johnson’s has been elected, each land needed for redevelopment in London will have to get a skyscraper, this is BIG news! The planning documents relating to PA 2008/4488 are available there online. Go to the Network Rail letter of 3rd February 2009 (the document is classed as ‘Other’). That Network Rail letter contains details of their Business Plans, from page 5 onwards. In it you will find a detailed exposition of the financial figures and processes I detailed in my last post. I will look into your other enuiries and will reply tomorrow. -It is a matter of basic physics, that in order to accomodate the size of the lengthened and straightened platforms in question, the Metro needs to be released. The land-swap arrangement is key to delivering the whole redevelopemnt of Clapham Junction station. -I am pleased that you raised the issue of the PCS building, as there appears to be a strong misconception of the current situation here. The PCS union owns its headquarters building. Metro is not trying to, and indeed cannot, force it to vacate. Metro continues to have discussions with PCS about purchasing its building. PCS is properly represented by professional advisors in these discussions and Metro has no doubt that PCS has its staff’s best interests at heart in these discussions. -Metro has studied the many options for how to deliver the residential element of the scheme. Some commentators have advocated ‘rafting’ over the station, in order to build wider and lower residential blocks. However, not only would this be a significantly more expensive (thus casting doubt on ability to finance the station upgrades), a wider, lower block would actually be more obtrusive in terms of shadow/sunlight and sightlines. This quote is a little disingenuous Cyril. Metro has never claimed that this is the fact, nor have we claimed that the Mayor has said this, and indeed, nor has Boris said this himself! All I could say is that it is public knowledge that both Mayoral policy and the London Plan consider strategic transport hubs as good locations for high-density living and tall buildings. This is quite an interesting site, and it is surprising there are so few comments. Only about 6 people seem to have contributed, which is a bit odd considering how many people will be affected. I am sure it gets a lot of readers, so how about adding a hit counter so that folks can see how many of us are following developments? You might also proofread postings because some of them are so badly written it is quite difficult to understand what you are trying to say. I hope this is helpful, and good luck. Regarding the stats, I can tell you that for a local and very specific website, I find the number of followers encouraging: about 1000 readers per week. Regarding the writing I can only fully apology for the mistakes. I hope anyway that the readers find valuable information. I would welcome your feedback on our contact form I you would like to spend some time to correct the most obvious errors your found and help us to improve the reading. Brendan> Sorry I don’t get it. I must be thick then, as despite your explanation of physics, I still don’t understand why you need to build two skyscrapers to lengthen platforms. I need a longer demonstration to understand the link between 42 storey x 2 and a train platform. Regarding PCS, you don’t bring any answer to the issue of the future of the building. You might have noticed that their staff is very concerned by the lack of consultation (and consideration) of Metro and that their representation highlighted fundamental errors and false assessment in the planning statement. As you might have read in the Evening Standard yesterday, Boris Johnson was actually elected on the promise to scrap tall “phallocratic” towers. He even went to encourage the ES to publish a list of plans that can be stopped if he is elected, including CJ’s. Therefore the majority of people will join me and disagree with your statement: Mayoral policy is NOT public knowledge. Without appearing to cast aspersions, in answering your question about why Metro’s proposal is needed to deliver the platform improvements I was employing the plainest language possible, without dumbing down what is a complex issue. Network Rail do not have enough land to lengthen and straighten the platforms to current standards: which is why Metro are proposing making land they control, available to Network Rail for that purpose. I cannot be any clearer. The land-swap arrangement would be delivered as a key part of the wider Clapham Junction proposals, which include the two 42-storey buildings. To pay for the station improvements, the plans need to generate signifcant funding from a relatively development small site. Metro considered various designs for a mixed residential-retail scheme, inlcuding a lower but broader structure. However, extensive studies have shown that this approach would have a more deterimental impact on the skyline than two tall and more slender buildings. -As I have said previously, Metro continues to have discussions with PCS about purchasing its building. You asked me to have a go at correcting the badly written articles, so here is my first attempt. I have only done a couple because, frankly, there are so many comments that are gobbledegook it is difficult to know where to begin. Thanks for the help, I am going to make the changes. I amended your message to avoid the list of amendments.